So today’s post is a collaboration with Jess who runs the blog Happiness Looks Gorjess, she’s just started out with blogging but already has some great posts uploaded on her page! She loves a lot of things I do such as beauty, lifestyle & travel not to mention she’s such a lovely girl so you should check out her blog asap! As you can see it has a pump dispenser which I love & I also really like the packaging for this foundation. I got the shade Medium Light which I thought would be way too pale for me but turned out when I blended it into my skin it was a perfect match. Straight away I was really impressed with that because I can never find one shade that suits me I always have to mix a few foundations together to get my shade. This foundation also claims that it helps your skin. On the box it says that overtime your pores will appear smaller and skin appears noticeably firmer and more radiant, I don’t know how true that is, I’ve only used this a few times within the past week but if it works then I’ll be very impressed. So as you can see in the picture it helped cover up the redness on my face. It was really easy to blend out this product, although it isn’t full coverage I was still able to build up the product without it looking or feeling cakey. The packaging says it’s got a luminous finish & although it’s was matte I didn’t think it was that luminious. To be honest I think it’s just right because it looks really natural in person. I wore the Hybrid Complexion Perfector from about 9:30am when I left for uni, came home at 4:30pm & the foundation looked like I had just done it. This product cost me $52AUD while my other foundation I used to use on a daily cost me $70AUD. All in all I will 100% repurchase this product. I absolutely love the way it feels on my skin & how it makes my skin look. The product that caught my eye was the Urban Decay de-slick setting spray. I decided to try out the travel size version as I wasn’t sure how I’d feel about this product. Before actually purchasing this product I had read a lot of great things about it. I’ve also stuck with the MAC Fix+ for years now & thought I’d try something else. First impression was that I really disliked the smell of this product, it kind of smelt like an old damp room but after a while the smell wasn’t AS bad, it had more of a really mild mature woman perfume, I don’t even know how to explain it to you guys. Quite disappointed thought because Jess tried out the All Day All Night duo set & said it had a summery smell which is what I would have loved to have. Despite the smell this product worked really well in keeping my makeup in place and it did make my makeup look really good. When I tested it out by spraying it on my hand it kind of had the texture of a mattifying/porless primer. So it was pretty much a must for me to recommend Tarte to Jess. It’s without a doubt in my top 2 favourite beauty brands. I’ve tried their makeup & their skincare products and have never had a bad thing to say about anything I’ve tried. I decided to try out the Scrub Clean set. This set comes with the FRXXXTION Stick Exfoliating Cleanser, Rainforest of the Sea Deep Dive Cleansing Gel & a “Cleansing Cutie”. I’ve heard so much amazing things about the cleansing gel so I was extremely excited to try this out! I’ve got 1 few too many cleansers so I was waiting till I finished mine but this was a perfect size that I could try out before getting a full size. It’s quite a watery light cleanser which I love as smells super fresh. The Frxxxtion stick left my skin feeling extremely smooth, the beads were really really small (felt a bit like sand) so you can tell it was exfoliating everything & everywhere. The silicone brush was new to me I’ve not used anything similar to it but I do like it. It’s small enough to travel around with yet big enough to clean your face. The flexibility of it also allows you to be able to cleanse every bit of your face which I like as I get most dry around my nose & this product made it very easy to exfoliate around it. I’m quite 50/50 on this product, I did really like all of them but when it comes to skincare I am really picky because I have sensitive skin & these products didn’t stand out for me. Mind you I have only used this product a few times so I can’t really say how well it’s worked I might have to write an updated post on it. Tarte products have never let me down so I’m pretty sure I just have to use these a few more times! That’s it for the products I really hope you guys enjoyed this post! 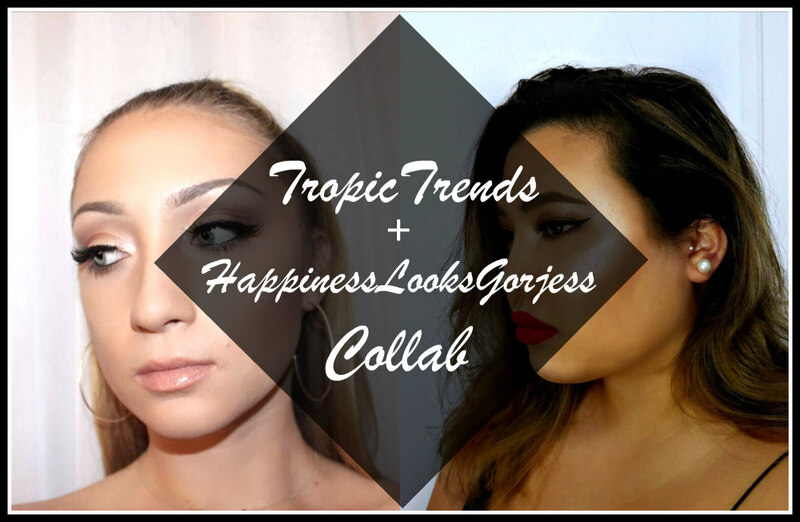 Make sure you head over to Happiness Looks Gorjess to see what product I recommended to Jess, her first impressions & what Tarte product caught her eye! Also, don’t forget to give her wonderful blog a follow & check out her social media pages! Omg this a great post! Loved the complexion perfector! Jess has a wonderful blog and deserves a follow! It seems like you had so much fun with this collab and I enjoyed reading your post. I’m not big on trying new things but I’m inspired. Your post made me curious about UD hybrid complexion perfector. It looks amazing! I’d definitely recommend trying it!